It is the progeny from the cross Alphonso x Neelum. It is a late season variety, fruits come to harvest during last week of June. Tree is semi-vigorous in nature. Fruit is elliptic in shape, medium sized weighing on an average about 270-280g. Fruit stalk is inserted vertically. Fruits on ripening get golden yellow blush. Skin is smooth, medium thick. 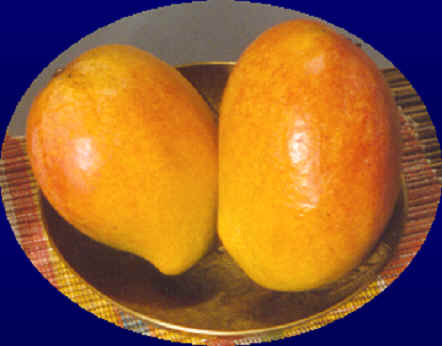 Pulp is deep yellow in colour and firm. It is free from fibre and spongy tissue. Pulp recovery is 70%. Keeping quality is good.